Life doesn’t define you. Love does. For anyone who knows all too well what it means to be human—and, by extension, fallible—Love’s A Cure is the album your soul has been calling for. Have big dreams, but not sure you’ve got what it takes? Lemons In My Pockets might be for you. Have a war raging inside your head between you and the world around you? You might like Into the War. Still holding onto the past…even though you know it might be the one thing that breaks you? Try Hard Road. In a relationship, but feel like perfect strangers? Listen to Stone Walls. Anxious to let go and release your inner free spirit? Jenny is your song. Trying to imagine something better for yourself in this life? Throw on Running From Empty. Just had a relationship end because you simply had to let go? Try Not The One. Since releasing debut LP ‘Love’s A Cure’, a breezy album of rock-pop originals last year, Alison Andrews has established herself as one of the most melodic writers on the Metal Asylum scene. This album is an outstanding debut offering, and one of the best mixed and mastered albums we have come across this year. It is the kind of album that makes you smile and want to tell people how much you love them, no, really, trust me it does! We love ‘Emily’s in Trouble’ and ‘Giving it All Away’. This album will appeal to those who like the lighter side of rock! Deriving influences from guitar-driven 90’s alternative rock tunes…The album opener’s catchy chorus recalls the staples of great alt-rock radio in the nineties, with perhaps Sheryl Crow the best example of a contemporary. Andrews’ dynamic vocals continue to sail through the album’s 13 tracks. On “Lose Once” the addition of harmonica and background harmonies creates a luscious sound which helps give the album a cheerful ‘lift’. Andrews’ strengths shine through the upbeat tracks…the Americana/Folk flavors which are introduced in a couple of tracks (“Trip Me Up”) suit the singer/songwriter’s style well and play in her favor. Alison Andrews, a powerful folk rock vocalist and the woman who has, with the help of her husband Jaye Lentin, created a strong and soulful sound. 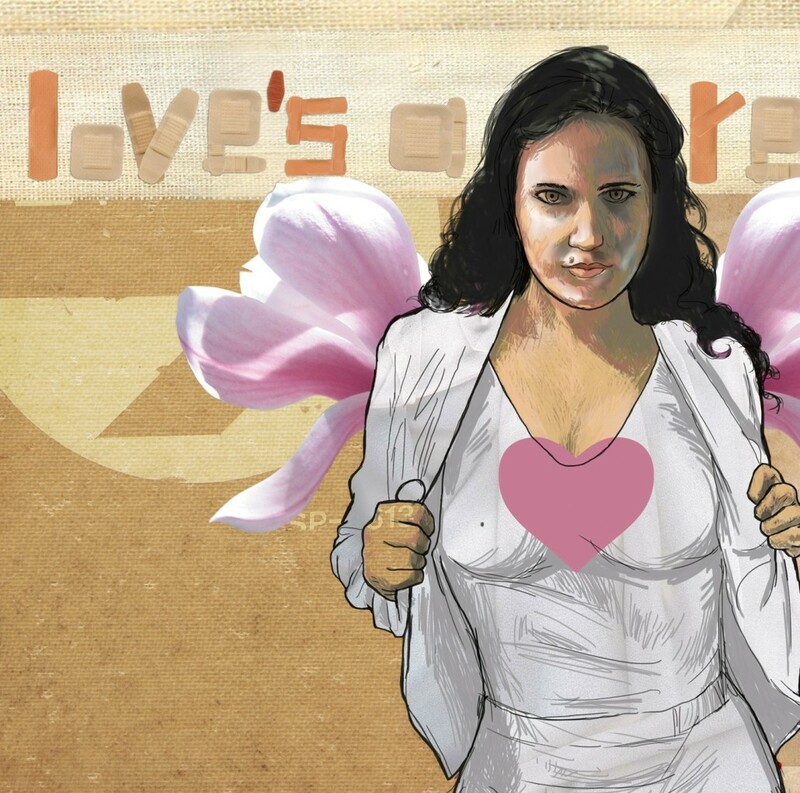 She has just released her debut album, ‘Love’s A Cure’ ….which we think is one of the strongest albums we have heard coming out of the UAE music scene in 2011. Alison Andrews, a South African singing sensation whose acoustic folk rock is truly beautiful. Alison and Jaye combined the beauty of Jaye’s songwriting with Alison’s strong and soulful vocals (think 1950′s female singers such as Doris Day and Wanda Jackson). This winning combination catapulted them onto stages in Cape Town and Taiwan, with regular gigs in Taipei and a performance at the prestigious Spring Scream Festival. 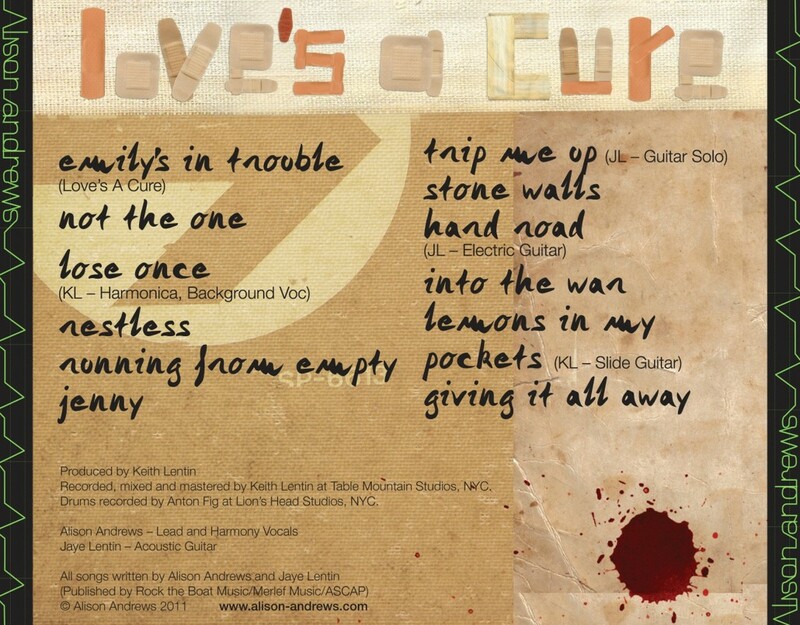 Love’s a Cure is available on iTunes. Love’s A Cure is also available from Amazon.